First there were Flare Jeans and bell bottoms the wider the better then the bootcut jeans, then the skinny jeans, then the ripped jeans … and now the cropped jeans. It seems like trends in denim come and go frequently, I'll be on trend with one style, then a new trend is starting.. then restarting before you know it again. The mullet hem/step hem jeans are a look I’m happy to give my attention to, I love skinny jeans the shorter the better and now I can make the hem as short as I want them! Besides being a great way to upcycle an old pair of jeans, this DIY is also the patron saint of ankle-strapped shoes, and giving the perfect platform a display. I hope you all enjoy cutting your denim! I would love to see your end results! I love how short mine are! They are perfect for showing off all of my ankle strap wedges!! 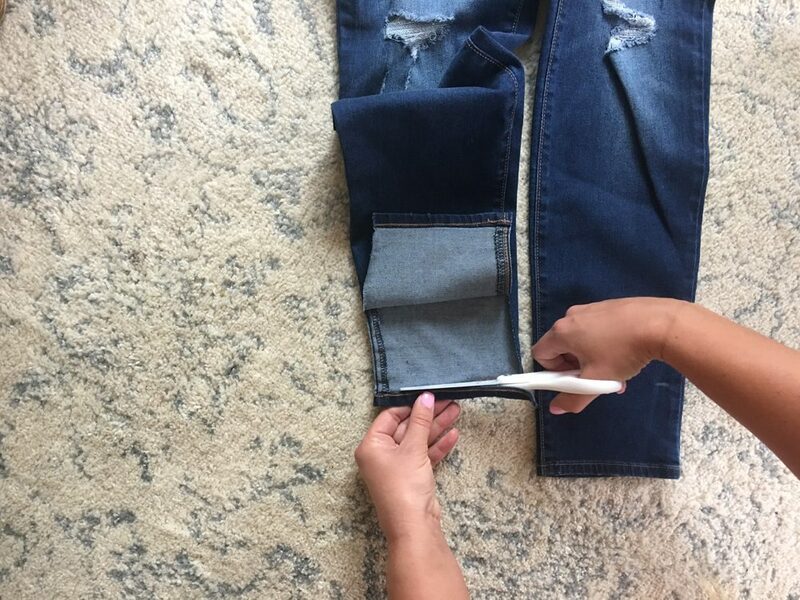 Once your jeans are marked, try them on to make sure you like where the new hems will lie on your legs. If you think it’s too short, re-mark a little lower. The chalk will wash off, so nothing is permanent until you start cutting! Keep in mind that you will be fraying the hem, so afford a little extra length for this effect. 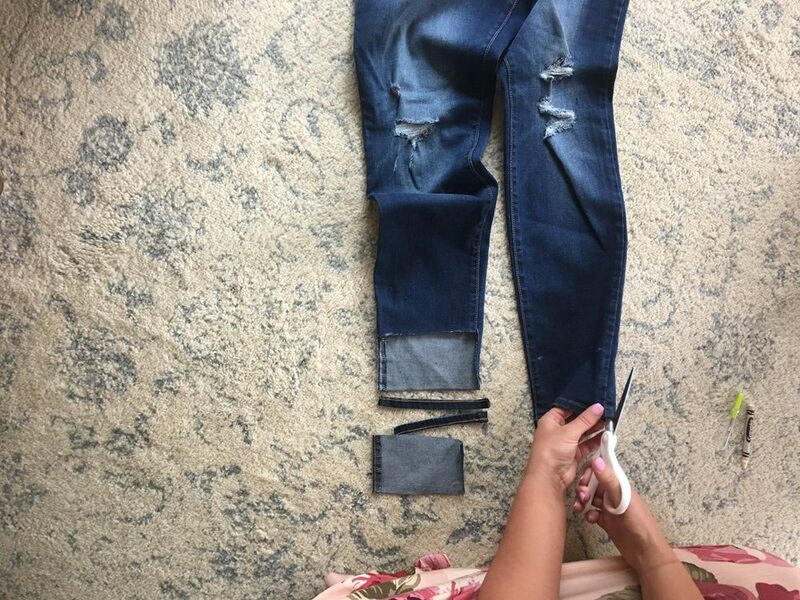 When the jeans are marked and measured to the perfect length, lay them flat and cut up the inseam with the fabric scissors, first on the front side, then on the back. 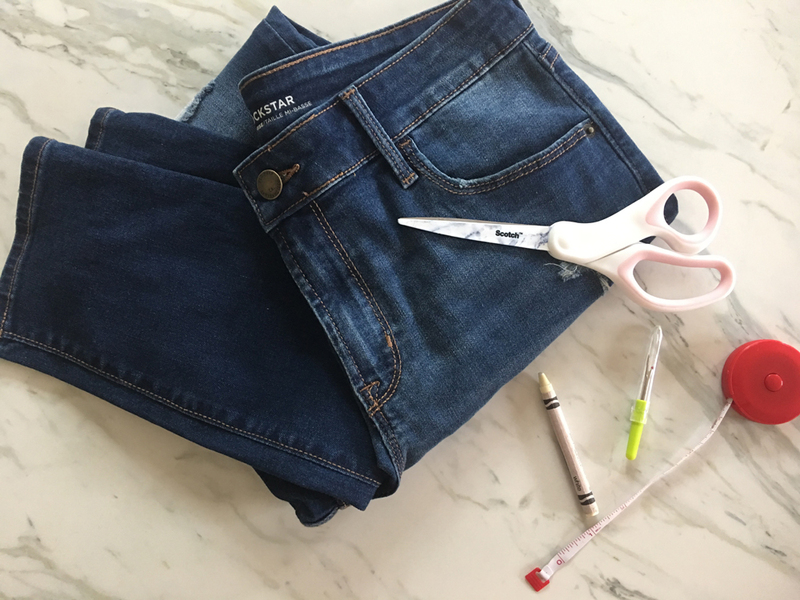 To get that oh-so-chic fringed effect on your hem, use the seam ripper to start pulling threads loose from the fresh cut at the bottom of the jeans. This process might go slow at first, but once you get a few major threads loose, it will start going a lot faster! Part of the appeal of fringed jeans is that the fringe will continue to wear and distress naturally as you wear them. If you want to keep the fringe exactly how you have it, lightly line the top of the fraying with a clear nail polish top coat and let dry! 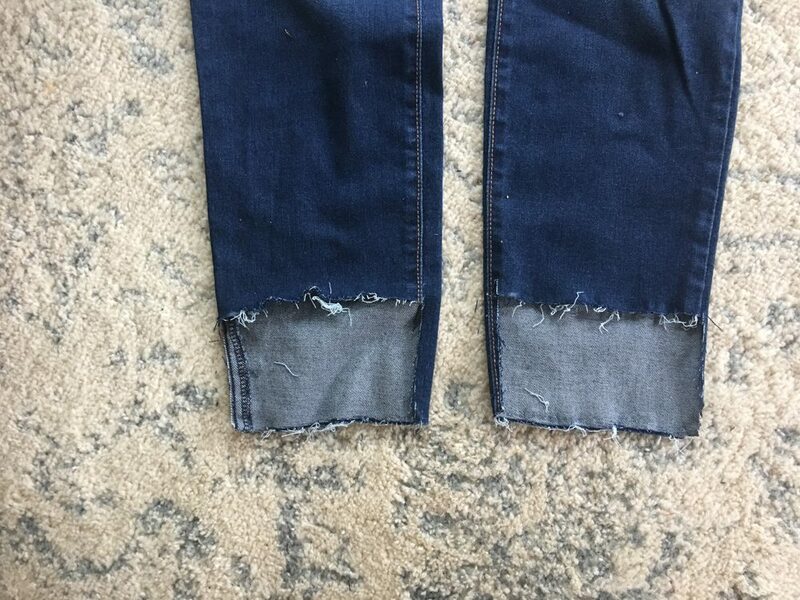 And there you have it, Your very own step hem jeans! Mix + Mingle in Fort Collins this Summer!